My husband and I had an opportunity to see my son perform in a college concert last week. 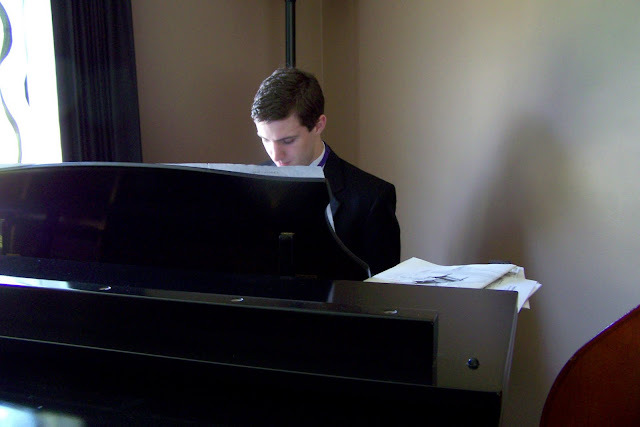 If you’ve been around the blog for a while, you will know that my oldest son is a musician. We thought he would make a good engineer but he is following his passion. When we were visiting colleges with him I wondered how any 17 year old could know what they want to “be”. They are so young. When I was 17 I don’t think I had a passion. I was a good student and “smart” by certain standards. I dabbled in an art class and crafts at home, loving them, but never had time to pursue those. I kept forging ahead, selected chemical engineering as a major while also pursing pre-med classes. How do you know if medicine is your passion? Engineering? By about junior year I was pretty sure engineering was not my passion, but couldn’t turn back. I decided that my life would be a journey through many careers. My daughter started college this year. She is brilliantly smart, opinionated, talented. But finding her passion is a challenge and a journey she is just beginning. I remember the first few years of working exploring different departments. I loved teaching and working with customers in technical marketing. I also remember, during a class I was taking, drawing “Men and Their Big Heads.” (I’ll blog about it someday). No wonder I wasn’t a very good engineer…I was too busy drawing in class! So perhaps I wasn’t able to find my passion at a young age, but I did hope to be a mother some day. So what are my passions now? That’s a few….what about you? What is your passion? Knitting, creating, designing, teaching. I spent many of my work years organizing people, but I was very ready to give that up this year. I’m enjoying every minute of *my* stuff! knitting, teaching, children’s books, doing art with children, etc. i hadn’t found my passion at 17. i commend you and your husband for allowing your oldest son to follow his passion. i don’t know many parents that would do that (in fact, i can count them on one hand!). he is very lucky to have your support.